​RCF Restoration hoarding clean up services will provide you with a fresh start. During every step of the hoarding cleanup process, our team are completely discreet and utilize only unmarked, plain yellow vehicles. RCF Restoration’s mission is to help those afflicted with this disorder and to provide our clients with the tools and skills needed to live with a clutter free life. We do offer a total understanding, trust and hope in a caring, compassionate and discreet environment, while providing the quality care our clients expect and deserve. From the initial contact, through cleanup and ongoing support, our desire is to help our clients live a better life physically and emotionally. 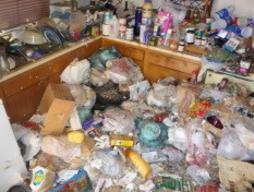 If you are considering finding hoarding help, please give us a call. After years of performing hoarding clean up, you will not find a more sensitive, caring team of professionals with a proven system. Each team member is trained in hoarding cleanup, valuables recovery, and the psychology of the disorder as well. Their tender approach and sensitivity to your needs will be felt as soon as you call. Remember, we have seen things that to the untrained person would be unimaginable, but to us it is another opportunity to give someone their home and life back.